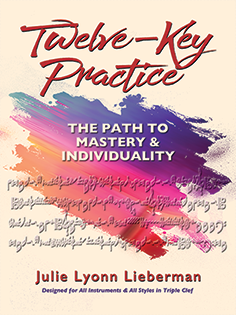 Announcing Julie Lyonn Lieberman’s NINTH book! 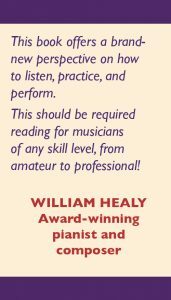 Twelve-Key Practiceis designed for ALL levels, styles and instruments. 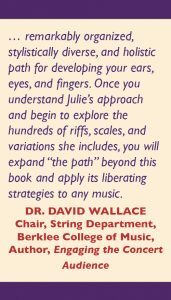 Julie Lyonn Lieberman provides comprehensive step-by-step practice techniques sequenced to harness the many facets of the musical brain. 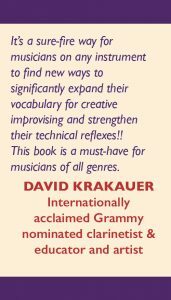 Her comprehensive system also offers hundreds of riffs, rhythms, and scales in American and world styles. 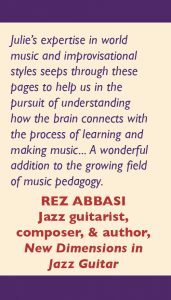 Imagine if you could HEAR a musical phrase, VISUALIZE its layout on your instrument by “seeing” and “feeling” the fingerings and/or embouchure in your mind’s eye, KNOW the names of the notes as well as the degrees of the key and FEEL the dynamics you want to include. All simultaneously, in a millisecond, and without moving a muscle… and in any key! I just bought your new book. 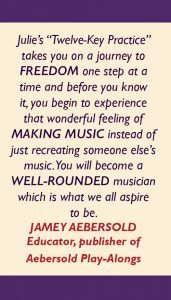 I think that you have one of the most brilliant and fascinating minds I have ever had the privilege to encounter.